King tides are expected to impact shorelines across the Bay Area Monday and will continue through Wednesday, according to the National Weather Service. The weather service issued a coastal flood watch for the immediate coastline and the San Francisco Bay. National Weather Service officials said residents could expect to see minor coastal flooding in these areas that could impact low-lying roadways, parking lots and access to beaches, coastal trails or coves. During low tide, the waves could produce strong rip currents, officials from the weather service said. 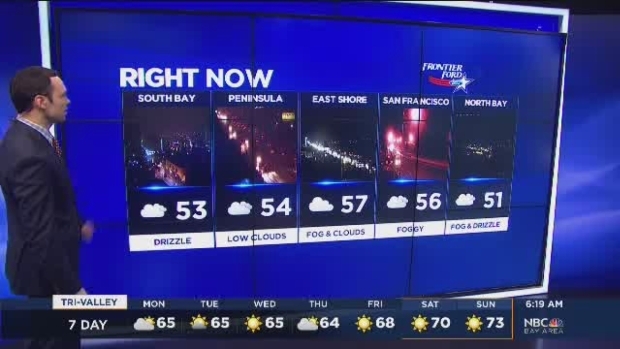 Meteorologist Anthony Slaughter has a look at your Bay Area forecast, which includes some morning fog, but plenty of afternoon sunshine for your Monday. The gravitational forces of the sun and the moon cause the tides to rise and fall, weather service officials said. The most extreme tides occur when Earth's orbit takes it slightly closer to the sun, while the moon's orbit also moves in closer to the Earth. High tides will occur between 9 a.m. and 11 a.m. and low tides will occur between 4 p.m. and 6 p.m. Monday through Wednesday, according to the National Weather Service.